Recently, I became aware of a fact that frightens me: that less than half the children under six in the USA are read to each day. The number is similar in Australia, where two thirds of the parents surveyed reported they didn't read to their kids because they didn't have enough time. No time to read to kids??? I truly believe that Jim Trelease is right when he says, "Reading aloud is one of the most important things that parents and teachers can do to promote the happiness and future success of children." It appalled me to think of those youngsters missing out. 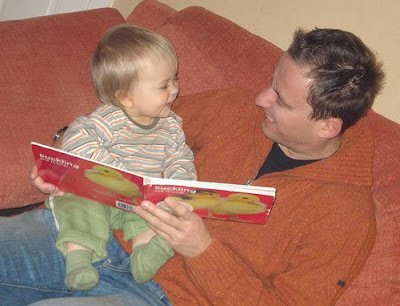 Surely, if parents know and understand how important reading aloud is, they will change, they will make it a priority? I want to reach as many adults as I possibly can with that message. But what can I, a humble Book Chook, possibly do to influence people? My blog gets wonderful visitors, but not yet in the thousands! Can one person really influence the actions of others? A young man is walking along the beach, picking up stranded starfish and throwing them back into the sea. A fellow calls to him,"Don't be ridiculous! There are thousands of starfish on the sand. How can you possibly make a difference?" The young man looks at the starfish in his hand, then looks up at the questioner. "I can make a difference to this one," he says. Recently, NASA asked internet surfers to log onto the Hubble Web site and vote for one of six astronomical objects that the telescope will then photograph for the first time. Maybe my vote will swing it for the two colliding galaxies currently in second place. Maybe your vote will make that crucial difference. If you too believe in the importance of reading aloud to kids, won't you join me in spreading the word? If you already read to your own children, how about volunteering to read aloud at a school, or to the kids next door? I am posting on forums, on Twitter, on Facebook. Others are designing their own car magnets or T-shirts to get the message out that reading aloud really helps.